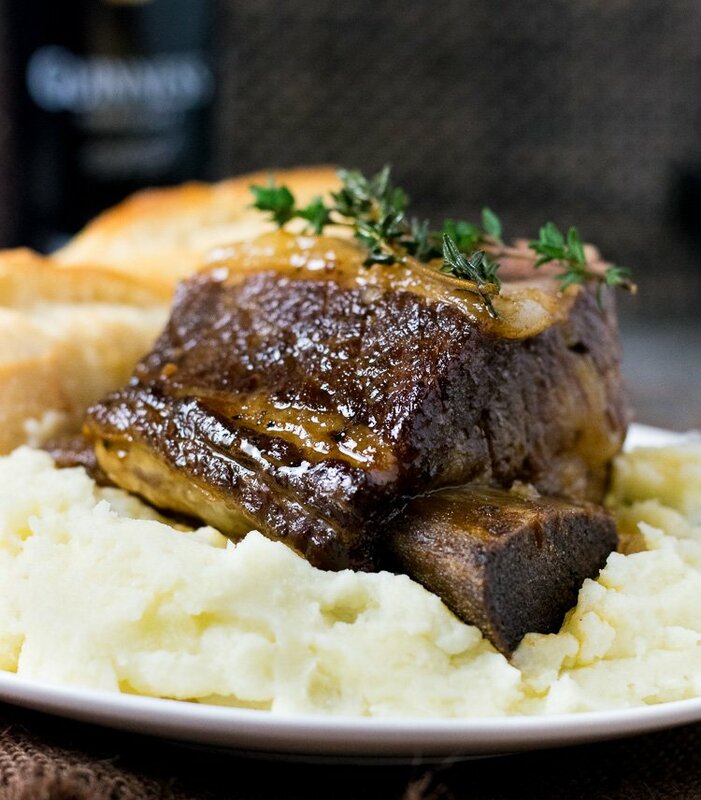 This Beer Braised Short Ribs – Dutch Oven recipe will transform beef short ribs into the most tender, succulent, and richly flavored feast you could ever imagine. The depth of flavor is unbelievable. There are two things I love about these Beer Braised Short Ribs. First of all, the flavor is absolutely astounding. Seriously. Giant hunks of beer saturated meat clinging loosely to protruding bones, this meal is satisfyingly primal. Second of all, my recipe only calls for 1 1/2 cans of beer. Spoils for the cook! Sometimes a slow cooker doesn’t cut it. Sometimes you need a dutch oven. 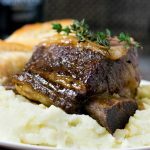 If you are going to make these Beer Braised Short Ribs, a dutch oven is the best way to build deep layers of flavor that permeate every bite! 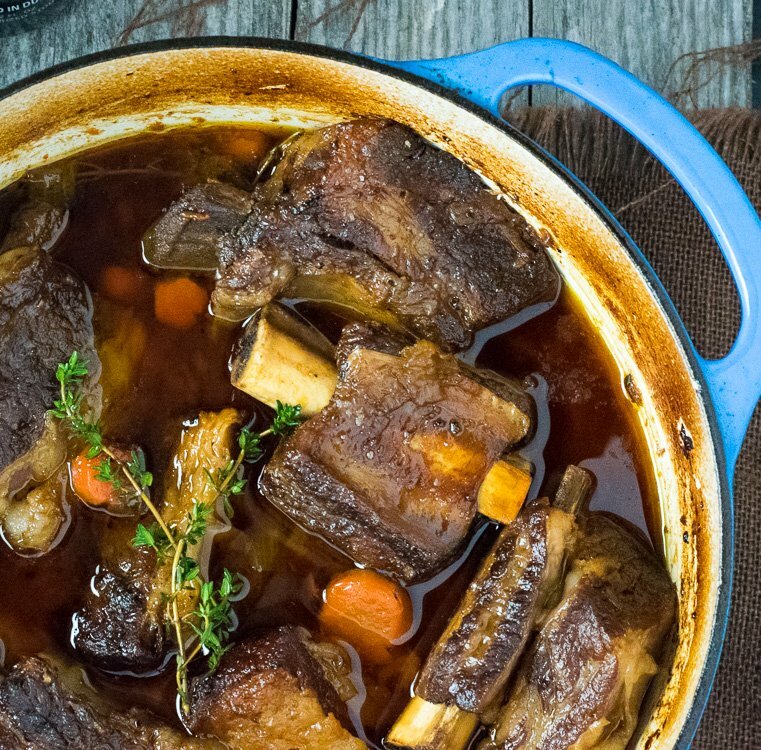 How does cooking these Beer Braised Short Ribs in a dutch oven build flavor? Let me explain. When you use a slow cooker, you are typically dumping all of the ingredients in at the same time and letting it do its thing. It is simpler, and hassle-free, but it isn’t the way to maximize flavor. By using a dutch oven you have more control over the heat, and therefore the cooking process as a whole. The dutch oven can be set over a hot stove top burner to sear a crisp brown crust on the beef, and then tossed in the oven to slowly braise as richer flavors develop. Brown food tastes better. Why else do we sear meat and saute vegetables? So I guess what I am saying is, you need a Dutch Oven for this recipe. The one you see pictured is the dutch oven I own and love (though in blue). However, if you have a bit more money to throw around you will LOVE a high end Le Creuset Enameled Cast-Iron Dutch Oven. The reviews on it are astounding. The above link is an affiliate link. 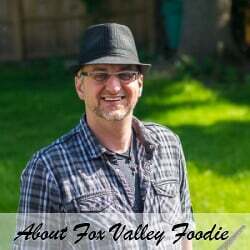 Any Amazon purchases through this link helps support FoxValleyFoodie.com at no additional cost to you. Add oil to dutch oven, set stovetop burner to medium high heat and brown short ribs seasoned with salt and pepper on all sides. Work in batches if needed. Remove short ribs from dutch oven and set aside. Add onions to dutch oven and saute in remaining oil until tender and beginning to brown. Add garlic, celery, and carrots and saute for five minutes longer. Add tomato paste and sugar, cook for a minute longer. Add 1 cup of stock to deglaze the dutch oven, scrapping all brown bits accumulated at the bottom of the pot, then add remaining liquid. Return meat to the dutch oven and add remaining ingredients. Bring stew to a simmer then place lid on dutch oven and braise in the oven for 2 - 2 1/2 hours. Meat should be exceptionally tender when finished cooking. Cook longer if still tough. Taste for salt and adjust as need. This recipe really shines when properly salted. The stew can be enjoyed right away, however the flavors intensify if allowed to meld overnight. This is a great meal to make ahead. To reheat, place in a 350 degree oven for 1 - 1/2 hours. IF YOU LIKED THIS RECIPE check out my Crock Pot Italian Beef Sandwiches recipe too for more out-of-this-world beef flavor! *Calories listed are a vague estimate and accuracy should not assumed. If you enjoyed my Beer Braised Short Ribs – Dutch Oven recipe then you should probably like me on Facebook and follow me on Pinterest too. That’s what I would do at least, because if you don’t get to know me but you still use my recipe it is kind of like taking candy from a stranger, and your mom taught you not to do that. Don’t disobey your mom, subscribe to Fox Valley Foodie today. We do have a Dutch oven just like the one shown. We use it all the time and love it. Now the recipe sounds scrumptious. The only problem we have is finding decent short ribs. I think the solution would be to special order. Great recipe!! Yes, finding good short ribs are key. If you have a hard time finding them look up a local butcher shop. 99% of the time they will be happy to get you a special cut of whatever you need. Our local grocery “Market” has wonderful short ribs and all kinds of meats. Real butchers purchase and even package much of the meat. My husband is a butcher and says chuck roast can be used in place of short ribs. I usually do this when the short ribs are too costly. Ive never been disappointed. Great recipe, Ben! We’ve always been a fan of great short ribs; yours look scrumptious. As for the Dutch oven, it’s one of our favorite members of our kitchen. Fantastic job, once again! Thanks Dan! Short ribs are truly underappreciated imho! Do you think I could easily halve the recipe? Could it be done in a casserole dish instead of a dutch oven? Most casserole dishes won’t be suitable for cooking on the stove top, so I wouldn’t recommend it. You could, however, use a normal skillet for sauteing and browning and then add everything to a casserole dish for braising (if it fits). Wow!! These turned out delicious and tender. Everyone loved these ribs! THANK YOU SO MUCH, BEN!! We don’t drink a lot of beer here. Can you just use regular beer? You probably could but stout would work better. Most grocery stores around here have a section where you can buy individual cans of beer. Then you don’t need to worry about wasting money on more beer than you need. What would you serve on the side? Mashed potato? Yes, I think mashed potatoes would be the best side. I like drizzling some extra juice over them when I serve up my plate! Can I substitute wine for the beer? cooking day ahead, do I store finished short ribs in refrigerator overnight in a tupperware or the dutchoven? Am I overthinking this? Overthinking! I would probably store it in the dutch oven just because it is easier. I went to two grocery stores looking for short ribs. The second one had some, but they’re boneless. I bought them but want to know if you think the cooking time or temp would need any altering. I’m only doing about half the recipe anyway (just got two packs of ribs, each around one pound). This sounds yummy so I’m hoping it will work! You should be good to go! These were amazing! I used root beer because I had no beer in house. They turned out great. They were even better the next day warmed up. Thanks so much! Amazing recipe! Thank tou for sharing, I made this using the only beer I had which was a craft beer and it came out amazing, restaurant quality stuff! Absolutely astounding!! This made a delectable addition to my meal routine, I cannot wait to make this again! Tender as can be & a very flavorful dish. Came out like a gourmet restaurant specialty. Will this recipe work in a 6 qt stainless steel Dutch oven, and should I keep it covered while cooking ? Yes, the instructions call for placing the lid on the dutch oven. A 6 quart stainless steel Dutch Oven will work fine. I made this ahead of time, but all the liquid got soaked up while cooking in the oven. Should I add more liquid in the dutch oven before I heat it up for dinner tomorrow? If so, what should I add and how much? I tried the ribs when they were fresh out of the oven and they were delish! Yes, you can add some more liquid (water or beef broth) if it evaporated. Only add enough to have it start pooling again, it doesn’t need to drown everything. I made this recipe today exactly as written. After less than 2 hrs in my enameled cast iron pot, the liquid had almost evaporated and I had to add additional beef broth since I was out of beer. Lol. They were very tender but somewhat dry. I think I will stick to my Chianti braised short rib recipe. I made this and I was absolutely delicious. Now I want to make it again for a large group. I hope it comes out as good. I will have to triple the recepie and use two Dutch oven casseroles. Cross my fingers. This was great, and my husband loved it!